Lapping America's most challenging road courses in John Lingenfelter's terrorizingly fast Ram Air Trans Am. Photos by Richard A. Lentinello and the author. We all knew about the beast before we'd ever laid eyes on it. We knew the color and the story, but had no idea what it would feel like when it was wrapped around our hide. We knew this supercar was a killer, and now we'd have a chance to drive it. We're talking about the mean and nasty LT1 Trans Am that is owned jointly by Lingenfelter Performance Engineering and Pontiac Motor Division. The car was given to Lingenfelter by Pontiac so it could be turned into a fire-breathing road-burner, one that could score big in the One Lap of America race that's held once each year. The OLA event encompasses a week's worth of driving -- 4,100 miles, to be exact -- with stops at 11 different road courses along the way. Cars running in the event are classified by vehicle price and there were 85 entrants for the 1995 running. Entries included BMW M3s, 1996 Porsche 911 Turbos, LT1 Corvettes, ZR-1s and more. The competition is fierce and very tough, but the technicians at Lingenfelter were ready for the challenge. Upholding Pontiac's honor is this 1995 Trans Am that can show its taillights to just about anything on a road course or drag strip. It was prepared by John Lingenfelter and his competent crew, at his shop in Decatur, IN. The T/A is fully loaded with the hot LT1 under the hood (and the dash) and it's also equipped with the Borg-Warner 6-speed, T-tops and the new-fo-'96 Ram Air induction system. 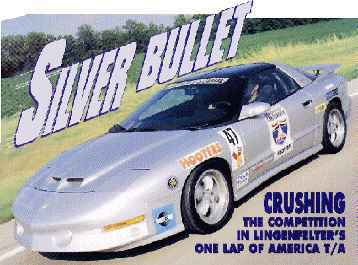 Lingenfelter knew he'd have to jack up the performance of the T/A if he was to take on the likes of Porsche Turbos and M5 Bimmers. Modifications began under the hood. The factory 305-horse LT1 was dropped out and taken to a special place where only a few are allowed. It was disassembled and then rebuilt with that special Lingenfelter touch. A custom, forged-steel crank replaced the stock 350 piece as did the eight billet steel rods. Eight .030-over pistons swing an extra .250 inch to give the mill a little more stroke. Compression in the 383-cuber has also been increased to 11.0:1. 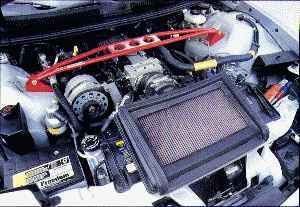 A stock oil pan rides underneath and holds the five quarts of Mobil 1 synthetic oil. The short block was finished off with a specially ground camshaft and then fully massaged LT1 heads were returned to the decks. The cast aluminum heads received larger 2.0- and 1.56-inch intake and exhaust valves, respectively, and then they were ported and polished to the hilt. Finally, a set of 1.6:1 Competition Cams roller rockers was bolted on to gain some extra valve lift. Next, LPE swapped with factory 22-psi injectors for a larger set of 30-psi units. Though the intake manifold remains stock-appearing, the innards have been opened up all the way. The standard mass air meter and LPE billet throttle body are fed by a K&N filter and Pontiac's new Ram Air system. Road racing and extended street thrashing demand special preparation so LPE relocated the Fram HP1 unit and added a Callies high-capacity, engine oil-to-water cooler. Engine cooling is handled by a high-efficiency aluminum radiator that is filled with water, coolant and Redline Water Wetter for the best protection against boil-overs. Before the engine was reinstalled, LPE bolted on a Centerforce dual-friction clutch for maximum holding power and filled the T-56 6-speed with Mobil 1 trans fluid. 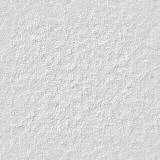 While some shun the idea of synthetics, LPE uses it extensively. A Hurst Competition Plus shifter tops off the trans and greatly improves shifter feel. To take full advantage of the 383, LPE installed a set of its own custom headers and a Y-pipe. This is backed by a factory catalytic converter and a Borla adjustable exhaust system. After implanting 125 extra horses, the gang at LPE added the necessary chassis and suspension goodies. A four-point roll bar stiffens the body along with a Hotchkiss strut tower brace for increased steering response. The suspension was enhanced with LPE progressive rate lowering springs, while Koni double-adjustable shocks and struts allow for fine tuning, whether on the street or the track. In the front, you'll find a 32mm anti-roll bar, while the rear packs a 19mm bar. Rear gearing is 3.42:1. The suspension improvements keep the car flat in the corners and under hard acceleration and braking as well. Speaking of the brakes, LPE tossed the factory binders for some seriously larger grippers. The nose gets a pair of LPE/Alcon four-piston calipers with 332mm-diameter discs (a little over 13 inches) and they're 34mm thick. The stock units measure 10.9 inches in diameter and are 32mm thick. The larger pads eliminate brake fade, which is rather important when halting the 3,700-lb. Bird from over 150 mph. The rear brakes remain fairly stock (bacause most of the braking is done by the front brakes) with the exception of harder Portfield R-4S pads. During competition, an array of pads was tried, despite the short amount of track time at each of the 12 road course stops. Each competitor ran a total of four laps -- one warm up, two timed and a cooldown -- at each road course. Because of the short number of laps, brake temperatures never became excessive, but a difference in pedal feel and braking capability was noticed by hired gun Doug Goad. Goad is from the IMSA Firehawk ranks and is vice president of TDM Technologies. When he wasn't blistering one of the race tracks, Goad shared seat time with team members Jason Haines (LPE) and Rick Lee (Enkei America). This made the T/A's cockpit seem rather cramped, especially considering they also packed a full-sized spare, clothes for three, extra parts, tools, two cellular phones, a Valentine radar detector and laptop computers. And let's not forget about the roll cage. Along with driver Rick Lee, Enkei provided the team with a set of 17x9.5-inch wheels that are wrapped with BFGoodrich Comp T/A ZR P275/40ZR17-inch radials. Tire selection was important because competitors were forced to run the event with only a single set of skins. The Comp T/A's performed perfectly, as they still had 0.220-inch tread depth left after the event (compared to 0.330 new). And it was on these tires that HPP laid down a 13.07 at 114 mph during a recent trip to Raceway Park in Norwalk, Ohio. With slicks and some 4.11 gears this is easily an 11-second Trans Am. And as for the street, we can report that on the roads in and around Norwalk the LPE T/A is absolutely exhilarating to drive. There's a surplus of power at any rpm, neutral, precise handling, accurate steering and a ride that's taut yet comfortable. One Lap festivities kicked off at the Hyatt Regency in Dearborn, MI, on Sunday morning, June 11. Racers completed technical inspection, decal placement and race preparation. The actual competition commenced on Sunday evening with the cars heading out to Road America in Elkhart Lake, WI. After arriving at the track, the LPE crew unloaded unnecessary gear and set the tire pressure for maximum traction. The track was a little wet, which caused adhesion problems, but the No. 47 LPE T/A was able to capture fourth place. The next track on the list was Blackhawk Farms in Beloit, WI. Goad was pleased with the available power and the brakes, too, but the suspension needed some tweaking. Haines adjusted tire pressures and rebound dampning on the rear shocks and they installed a video camera in the car. Though tuning had helped, the No. 47 T/A could muster only a seventh-place finish. A few track sessions had now passed and the car was looking good. Each time out they had placed in the top ten, which is important for overall points. During the next few races the team experimented with brake pads, suspension bump stops and strut/shock tuning. They even found a late night alignment shop where they dialed in the maximum camber and caster allowed. Then they adjusted the toe-in, and the handling was improved. Total road miles were counted at 2,370 and the next morning they faced Atlanta Motor Speedway. The Atlanta course features high-banked oval and tight infield turns, and the LPE Bird loved it. 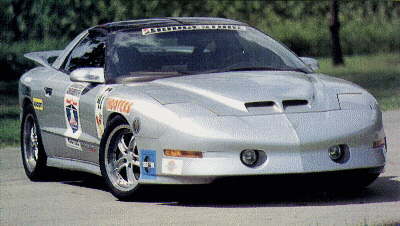 The Trans Am was really hugging the corners, which helped Goad to finish in third place. Next, the tour took the One Lap contestants to North Carolina and the famous Charlotte Motor Speedway. After arriving in Charlotte, the crew had the oil changed and they finally got a good night's sleep. The One Lappers could only use the infield road course at CMS, which is mainly reserved for go-carts. The tight track played right into the hands of some of the lighter cars, but the T/A still managed a fourth-place finish. When dawn came again, the LPE crew found themselves at Summit Point, W.VA. Summit Point is a fast track with lots of space and it was the perfect place for the bad Bird to flex its muscles. Goad did a masterful job behind the wheel, pushing the limit at every opportunity and using all of the 440 hp. He hung the T/A out and not a single car could match the No. 47 Trans Am that day. Goad finished first. The show continued north, all the way up to Watkins Glen, N.Y. Like Summit, the course at The Glen is very fast, 3.2 miles in length, and the T/A was, too. With Goad behind the wheel, the Lingenfelter T/A won again. There were only two events remaining. Nelson Ledges in Garretsville, Ohio, was the next stop and Goad, Haines, and Lee were ready. Nelson Ledges has a noise restriction, so the LPE crew had to act fast by installing the baffling plates in the Borla exhaust or risk disqualification due to excessive noise. They installed the baffle and made it to the line just before the race was started. The few horsepower they lost proved not to matter as Goad nailed down second place, right behind the '69 Camaro of Stuart Hayner. The last event was contested at the small, tight Waterford Hills in Clarkson, MI. They didn't expect this track to favor the T/A, but they still managed to finish fourth. Having won nine of the 12 track races, the '96 Porsche Turbo easily carried the most points, but the LPE crew was able to slip into second place, no doubt because of its consistent performance. Jason Haines claims that LPE is already working on the 1996 program and he tells us it's going to get even better. With added Lingenfelter power and handling on tap, we're sure Team LPE means business, serious business. So look out, Porsches, and stay clear Bimmers, because the big, bad firebreathing Pontiac will be back.